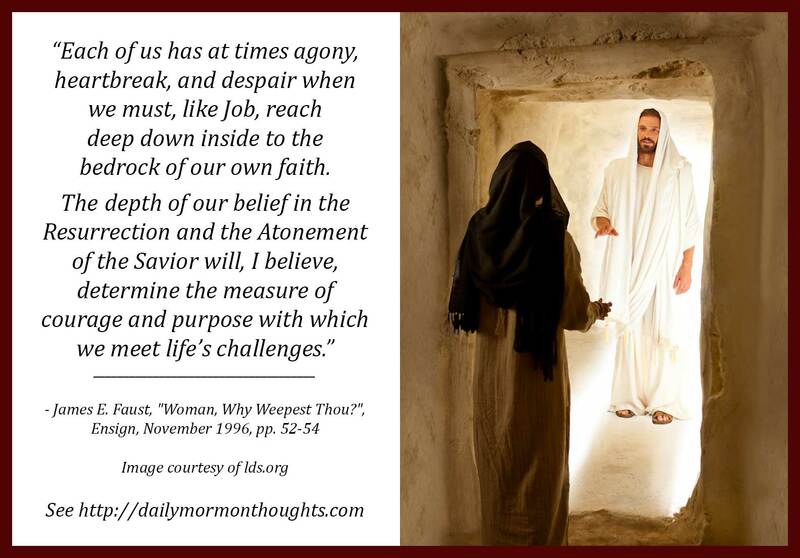 "Many who think that life is unfair do not see things within the larger vision of what the Savior did for us through the Atonement and the Resurrection. Each of us has at times agony, heartbreak, and despair when we must, like Job, reach deep down inside to the bedrock of our own faith. 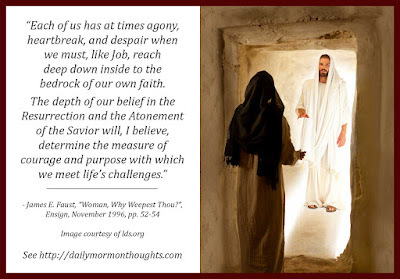 The depth of our belief in the Resurrection and the Atonement of the Savior will, I believe, determine the measure of courage and purpose with which we meet life’s challenges. "The first words of the risen Lord to His disciples were, 'Peace be unto you' (John 20:19). He has also promised, 'Peace in this world, and eternal life in the world to come' (D&C 59:23). The Atonement and the Resurrection have taken place. Our Lord and Savior suffered that appalling agony in Gethsemane. He performed the ultimate sacrifice in dying on the cross and then breaking the bonds of death. 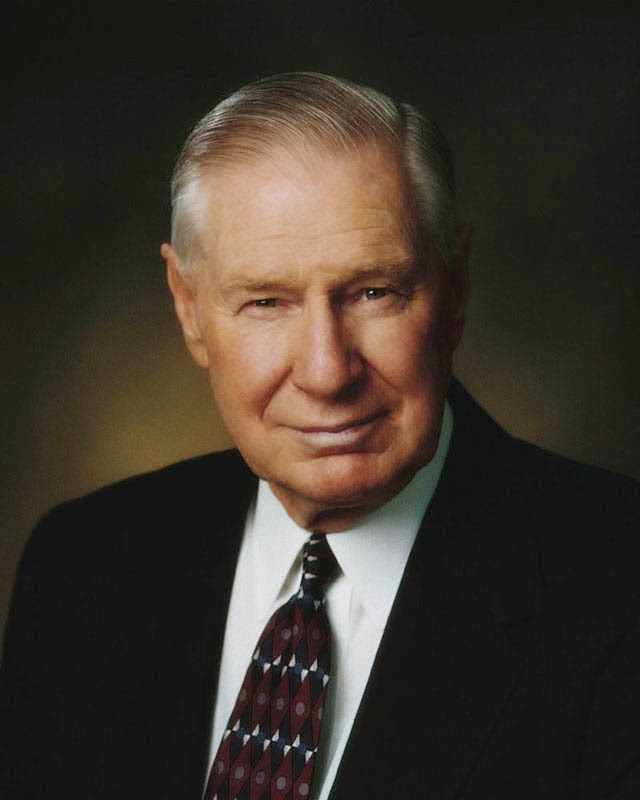 "All of us benefit from the transcendent blessings of the Atonement and the Resurrection, through which the divine healing process can work in our lives. The hurt can be replaced by the joy the Savior promised. To the doubting Thomas, Jesus said, 'Be not faithless, but believing' (John 20:27). Through faith and righteousness all of the inequities, injuries, and pains of this life can be fully compensated for and made right. Blessings denied in this life will be fully recompensed in the eternities. 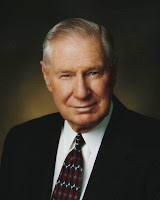 Through complete repentance of our sins we can be forgiven and we can enjoy eternal life. Thus our suffering in this life can be as the refining fire, purifying us for a higher purpose. Heartaches can be healed, and we can come to know a soul-satisfying joy and happiness beyond our dreams and expectations." And so the Savior offers us His peace, promises peace, if we come unto Him. That is the power of His love and sacrifice for us. Joy replaces hurt in life as we allow "the divine healing process" to work in our lives. With the eternal perspective, we see that the challenges and suffering of this life are "the refining fire" that purifies us to a higher purpose. The Easter promise is glorious indeed!